After enforcing all the constraints that we are aware of we can exclude most of the Rubik's Magic configurations corresponding to the shape of an octominoid (they are polyominoids made of eight square tiles). Octominoids are counted up to isometries, including mirror images, and are grouped into symmetric (with a nontrivial symmetry group) and unsymmetric. In most cases a given octominoid can be obtained with multiple nonequivalent configurations of the undecorated Rubik's Magic. It turns out that all feasible configurations, i.e. configurations that are not excluded using the known invariants, can actually be constructed. This means that the known invariants (metric and topologic) form a complete set of invariants. Following the links below you get a complete list of the octominoid configurations. The color code corresponds to the size of the bounding box (e.g. red for configurations with a bounding box 1x2x2) and follow the convention fixed by Jürgen Köller in http://www.mathematische-basteleien.de/magics.htm. They are further grouped based on the number of tiles of the octominoid that lie on the boundary of the bounding box. For example: box 2x2x2 (+6) means that the bounding box is a 2x2x2 cube and the configurations have 6 of the 8 tiles lying on the boundary of the bounding cube. 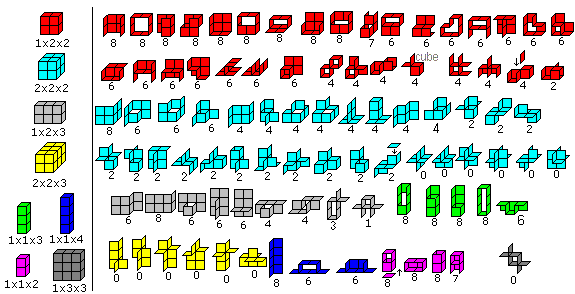 [Nourse] flat shapes: I-1, I-2, I-3; S-1,..., S-4; L-1, ..., L-8; U-1, ..., U-6. [Koeller] Jürgen Köller, Rubik's Magic (web page). [Jaap] Jaap Scherphuis, Rubik's Magic Main Page (web page). [Houlis] Pantazis Constantine Houlis, Folding Puzzles (web page). [Nourse] James G. Nourse, Simple Solutions to Rubik's MAGIC, Bantam Books, 1986.